Jim Carrey is a fine actor. His comedic style is legendary and his dramatic roles are very accomplished. With The Number 23 he tackles his first real thriller – with varied success. He plays Walter, a man living a relatively mundane life as a dog catcher. On his birthday, a delay in picking up his wife leads to her wandering into a second hand bookstore. This activates his psychological spiral when she buys him a book which was self published by an unknown author. 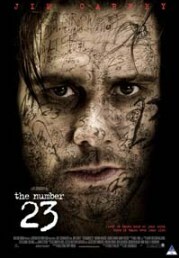 Slowly he becomes engrossed with the private investigator character Fingerling, and his trail through the obsession with the number 23 – a number which can be derived from many significant events. He also sees parallels with his own memories and begins calculating all aspects of his life, pointing to this number. He delves into this mystery and believes this book may have been written about him – this is countered with a slight Sin City look of the book’s narrative with Walter in the lead. Murder becomes the focal point and his obsession starts to dominate his life. While finding it unsettling, his wife assists him in his seemingly futile quest to find the truth. With some far fetched coincidences and sequences of events, the questions unfold. While the outcome could easily be guessed by viewers familiar with this type of film, making it less of a fulfilling experience, others will find it rewarding. Another case of illustrating Joel Schumacher’s versatility (from The Lost Boys, Falling Down and Batman sequels, to Flawless, Veronica Guerin and Phone Booth).